A stream of barberry flowing between banks of spirea. Now that spring has sprung and summer is here, our gardens have really begun to fill out. It is fun to see how the selection and placement of plants can provide a unique sense of movement to the eye, a stream of barberry flowing between banks of spirea. In this photo, the red of the barberry is like a stream or river running through the bed. 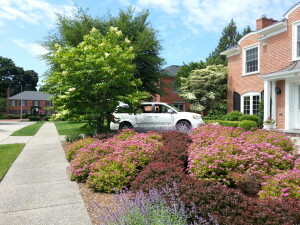 It is "banked" by spirea in bloom. Additional interest comes from the blue of the nepeta (catmint) in the foreground, and height is provided by the beautiful blooming Syringa reticulate, a late blooming lilac. Even after the spirea has completed its bloom, the contrasting flow continues as the bright chartreuse of its leaves plays off the deep burgundy of the barberry. Movement in the garden doesn't just come from the summer breeze!